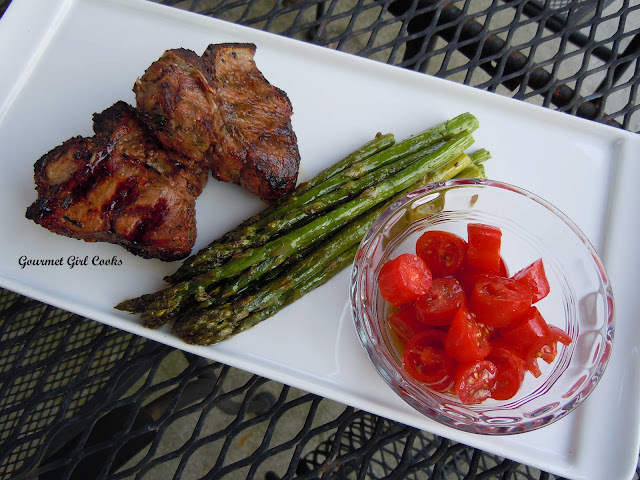 Tonight I made the lamb chops that I had originally planned to make last night, but ran out of time to marinate them long enough. 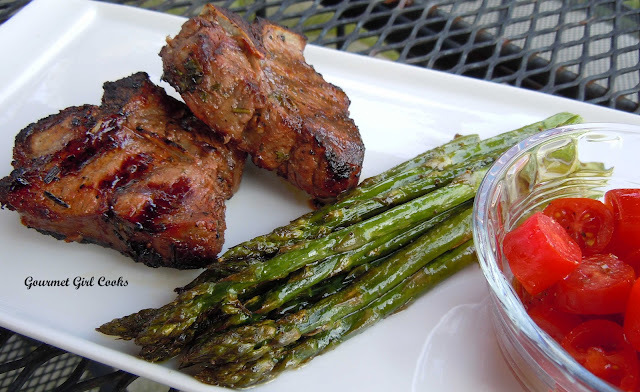 I made Greek Style Marinated Lamb Chops with Roasted Asparagus and then sliced some mini San Marzano tomatoes and tossed them in a little extra virgin olive oil, pomegranate vinegar and salt and pepper. Roasted asparagus is so simple to make -- I just cut off the tough bottom part of the stems, toss them with olive oil, salt and pepper and roast them in a single layer on a baking sheet at 400 degrees for about 15 minutes, depending on the thickness of the asparagus. The marinade for the lamb chops contains olive oil, lemon juice, lemon zest, fresh rosemary and parsley, lots of garlic, salt and pepper. It was a fresh, flavorful and simple dinner. Below are a few pictures as well the recipe for the lamb chops embedded in the link above. Enjoy! 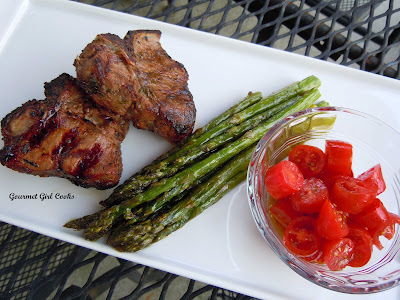 Hmmm ... time to pick up some more of those lovely Costo lamb chops! We had steamed asparagus tonight. It was good, of course, but why don't I ever think to roast it? Will do next time for sure. A couple of days ago my hubby made some delicious roasted mixed veggies. He included beets, which normally I'm not crazy about. But roasting really makes them shine! Quite yummy, indeed! How do you do it, you have a job and still you find time to create *beauty*. I am so impressed.